Rob Licence To Kill Unnecessarily? A round of applause please for the Daily Record and what must be the most contrived story of 2006 so far. The plot of James Bond's latest movie mirrors the real life killing of the Brazilian shot by police in London after the 7/7 terror bombings. A leaked script reveals 007 shoots a suspected bomber only to discover later that he got the wrong person and his target was unarmed... chilling echoes of the events of last July when Brazilian Jean Charles de Menzes was mistaken for a suicide bomber and shot dead. Chilling echoes? It's the plot of Casino Royale for God's sake. 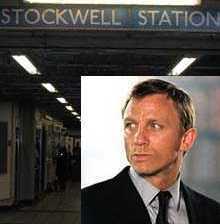 Now, if the producers had decided to make Daniel Craig go for a piss while he was supposed to watching his suspect and then built a huge soundstage to recreate the magic of Stockwell (MI6 is just up the road) we might possibly be able to permit the use of the phrase "chilling echoes". Until that happens we're going to steer clear of the Daily Record (just as soon as we've finished the article headlined CURLING'S FOR LEZZAS SAYS EDDIE THE EAGLE).